Expositions of the National Gallery, Municipal Gallery, National Museum, and more. 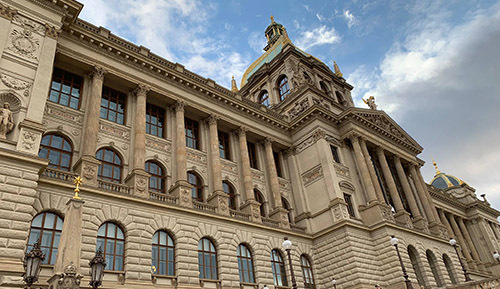 The rich artistic heritage of Prague and the Czech lands can be admired in Prague's many museums and galleries. Expositions of the National Gallery, Municipal Gallery, National Museum, and other institutions contain extensive collections of art of all styles and eras, ranging from fine art to applied arts to sculpture, and spanning over two millenniums. National Museum, Lapidarium, Lobkowitz Palace, Antonín Dvořák Museum, Museum of Decorative Arts, National Technical Museum, House at the Black Madonna, The City of Prague Museum, Mucha Museum, and more. Sternberg Palace, Convent of St. Agnes of Bohemia, Trade Fair Palace, Kinský Palace, Zbraslav Chateau, Trója Chateau, House at the Stone Bell, Municipal Library, Old Town Hall, Strahov Picture Gallery, and more. Get FREE ENTRY to many Prague museums and galleries with the Prague Card.